Background: Heterocycles are the gold mines in medicinal chemistry. Most drugs used in today's medicinal period possess a heterocyclic nucleus. 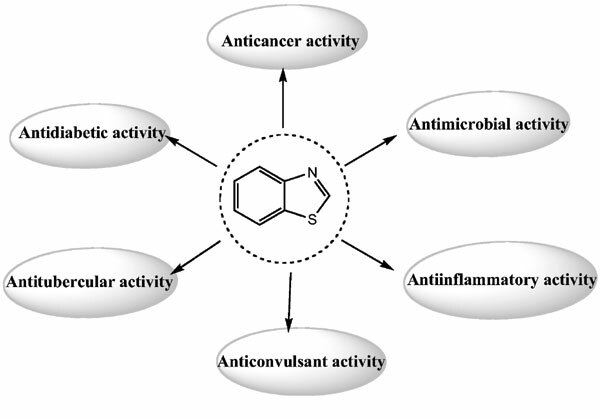 One of the interesting heterocycles, benzothiazole, a potent phamacophore, is highly important in the medicinal chemistry due to its association with diverse pharmacological properties. Development in biological evaluation of heterocyclic molecule has undergone manifold changes and the advancement in molecular biology has eased the design of new molecule based on their mechanism of action. Methods: A structured search of bibliographic databases for peer-reviewed research literature has been done using different database. The quality of retrieved papers was appraised using standard tools. The details of important papers were described to focus on the potency of derivatives of benzothiazole. Results: One hundred fourteen papers were included in the review indicating importance of benzothiazole derivatives. The review has been focussed on papers highlighting anticancer and antimicrobial activities. Several papers have been searched for anticonvulsant, anti-inflammatory, antitubercular and other miscellaneous activities. Keywords: Benzothiazole, anticancer, antimicrobial, anti-inflammatory, anticonvulsant, anti-tubercular activity. Keywords:Benzothiazole, anticancer, antimicrobial, anti-inflammatory, anticonvulsant, anti-tubercular activity. Abstract:Background: Heterocycles are the gold mines in medicinal chemistry. Most drugs used in today's medicinal period possess a heterocyclic nucleus. One of the interesting heterocycles, benzothiazole, a potent phamacophore, is highly important in the medicinal chemistry due to its association with diverse pharmacological properties. Development in biological evaluation of heterocyclic molecule has undergone manifold changes and the advancement in molecular biology has eased the design of new molecule based on their mechanism of action.